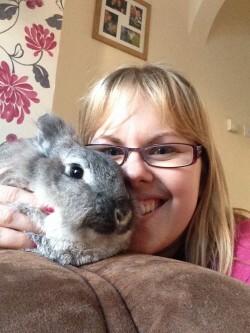 Vet Jen Smith saw an interesting case recently involving Blossom a 5 year old female neutered rabbit. 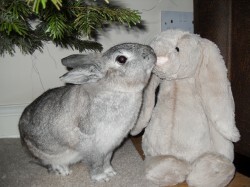 Her owner Fiona was concerned that Blossom was having difficulty and discomfort passing urine. 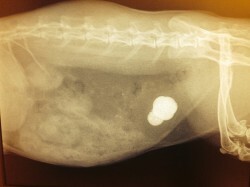 Examination and X-rays showed the presence ...of numerous bladder stones or "uroliths" as we refer to them as. Senior Vet Lisa Langford performed the tricky surgical operation of removing the stones from the bladder. One of the stones was particularly large as you can see from the photograph! We are delighted to report Blossom has now made a full recovery and is home with her family safe and sound. 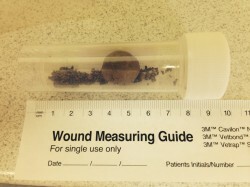 In June vet Jen Smith attended a weekend emergency case. Cookie a 3 year old Collie cross was bitten by an adder whilst out walking in the forest. Her owner has written an account of the experience, excerpts of which are shared below with her kind permission. 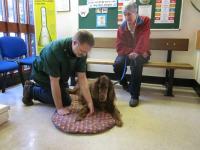 TAKE YOUR DOG TO THE VETS STRAIGHT AWAY Things can happen very quickly. For an hour after our dog met the adder she was running around. One and a half hours later the swelling started and she became groggy and two hours later she was terribly ill. TRY TO IDENTIFY THE SNAKE Being able to describe the snake meant we knew it was an adder bite and so our dog received the correct treatment and anti -venom. KEEP THE DOG CALM The bite hurts and dogs get distressed and frightened.The more they move around the more the heart pumps the venom around the body. Keep your dog calm and keep calm yourself as the dog will pick up on your feelings. DO WHATEVER THE VET SAYS! What they advise may not be obvious to you. We were asked permission to put Cookie on a drip and start treatment and I was worried it may be too stressful for her. My husband drove a round trip of 140 miles to pick up the anti venom as it was a Sunday night and it was the closest place to hold the anti venom that was open. The trip took two hours by which time our dog had collapsed. If we had taken her home without a vet and a nurse to hand she would have died. The veterinary teams preparations and foresight will save your dog's life. Trust them . BEFORE YOU GO OUT WALKING check the website, look out for warnings of adders. KEEP TO THE MAIN TRAILS There will be people around who can help you. KEEP YOUR DOG ON A LEAD AND YOUR CHILDREN IN SIGHT. Take walkie talkies. Make sure your phone works. have a meeting point and an emergency plan. CARRY A BASIC FIRST AID KIT AND WATER. Take a proper OS map and compass so you can identify your whereabouts. REGISTER WITH A VET THAT OFFERS A FULL OUT OF HOURS SERVICE IF YOU LIVE IN KIDDERMINSTER REGISTER WITH VALE VETS! Nine times out of ten you will be out at the weekend when most vets are closed. I phoned Vale Vets at 2.30pm on a Sunday afternoon and spoke with the emergency service. Five minutes later the vet called us back and by the time we arrived at the surgery the vet had set up the drip, located the anti venom, contacted a poisons specialist for advice and called in the nurse for support.The efficient call centre, the vet and nurses expertise and dedication and her network of support were just fantastic. I have absolutely no doubt that they saved our dog's life. At 10pm on Sunday night I was able to tell my little boy that his dog was coming home safe and sound. It could have been a very different story. 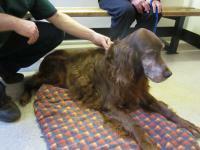 Harvey is a 14 year old Irish setter who has been struggling with arthritis for some time. In addition to his arthritis medication, Harvey has been receiving regular acupuncture sessions with senior vet Steffen Kutschke at our Stourport practice. 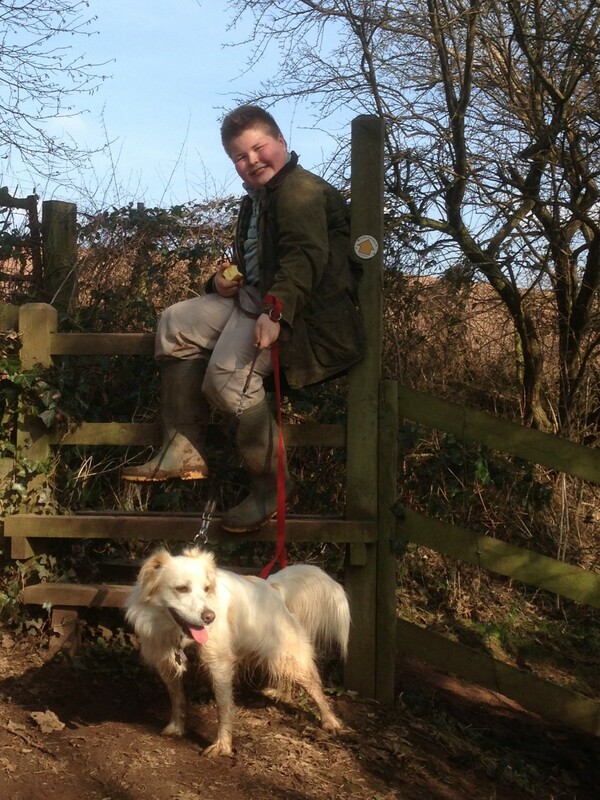 Harvey's mobility has improved as a result of the acupuncture and he can enjoy his walks again. Many conditions can benefit from acupuncture techniques either alone or in conjunction with drug therapy. Please telephone reception if you are interested in learning more.